The Safety 1st Wooden 2 Step Stool is suitable from approx. 18 months to a maximum weight of 22.6 kg (approx. 5 years) and enables your child to reach the sink by themselves. The lower step has a built-in handle and can be easily pulled out creating two levels for easy access to the sink. Made of solid wood to complement home interiors, it features v-grooved design to prevent children’s feet from slipping. Slip resistant pads ensure added stability on the floor. 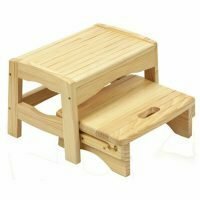 Thanks to its lightweight design, your child can easily position this wooden step stool to ensure easy access to the sink.